ProductCart is a feature-rich, PA-DSS compliant, robust eCommerce shopping cart program used by thousands of businesses to market and sell online. One of the great attributes of ProductCart is that each license includes full access to all source code which provides for unrestricted customization options. Via a robust back-end control panel each client has full administrative access to add unlimited categories, unlimited products and fully manage your product catalog without any technical knowledge or expertise. You can create new "content pages" to include within your catalog and manage the content via your control panel html text editor. 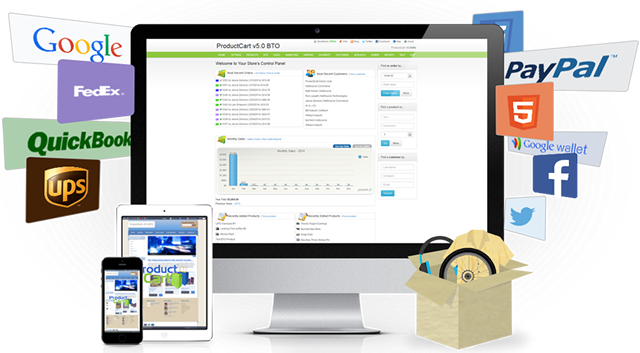 These add-on modules combine the functionality of our ProductCart Standard shopping cart software with the unique features of a product configurator and online quoting system, allowing businesses to handle the sale of complex products and services that are configured by the customer during the ordering process. Real-time price changes, dynamic product preview as you mouse over configuration items, unlimited categories of configurable items, category descriptions, and more. Configurator+ helps customers properly configure your customizable products by adding conflict resolution features. For example, you can configure a product for sale to determine whether or not customers should not be allowed to select an item when another one is selected or if an item should be selected when another one is chosen. This is what ProductCart refers to as Conflict Management. The scenarios are virtually endless.